JP ▼ 2009-09-09 pts ? US ▼ 2009-09-09 400pts ? (Trial Game) 2009-09-09 FREE ? UK ▼ 2009-09-09 pts ? AU ▼ 2009-09-09 pts ? EU ▼ 2009-09-09 pts ? DE ▼ 2009-09-09 pts ? KR ▼ 2009-09-09 pts ? (Pyeong-gapan Game) 2009-09-09 FREE ? Sonic & Knuckles is a downloadable version of Sonic & Knuckles for the Xbox 360's Xbox Live Arcade. It is part of the "Sega Vintage Collection" series. It has support for HDTV 1080p and contains leaderboards in addition to having voice support.  It mimics the original games lock-on technology by detecting if players have downloaded previous Sonic games to their console. If Sonic the Hedgehog, Sonic the Hedgehog 2, or Sonic the Hedgehog 3 it will reveal the ability to play locked on versions of the previous games. This means players can unlock Blue Sphere, Knuckles in Sonic 2, or Sonic 3 & Knuckles. The game costs 240 Microsoft points. Although the title screen prevents some cheats from being used, if you do the level select (Angel Island Zone) and debug mode (Mushroom Hill Zone) cheats in Sonic 3 & Knuckles, enter a Special Stage and exit while holding the button, you can still use the Reverse Gravity Glitch in the remaining levels. However, this is pointless, as you are unable to jump with any other button, even with the other buttons enabled (they all act as the same button).